NORWAY, 1894Olav -- son of Erik Bjørnsson -- seventeen,swung his father's scythe and dreamed:The singing scythe Grandfather Bjørn had madeand honed each time he found a bit of shadeand passed on to his oldest sonto pass on to his oldest sonto pass until there were no longer sons --the scythe hissed like the grains of sand on the beachthat hiss when a wave falls back and the bubbles burst.The wind that whispered through the grainand dried the sweat upon his arms and chestbore from the west the scent of saltand the distant rumble of the Norwegian Sea. The Viking Age began more than a thousand years ago when the ancient Norse perfected their swift-sailing, dragon-headed longships. Young men, and later whole families, left Norway's rugged fiords in search of open land, trade, treasure, or fame. Many others took to the unknown sea simply because something vague and irresistible beckoned to them. They settled islands all across the North Atlantic and landed in North America more than four hundred years before Columbus. Their exploits are recounted in the ancient Norse sagas. 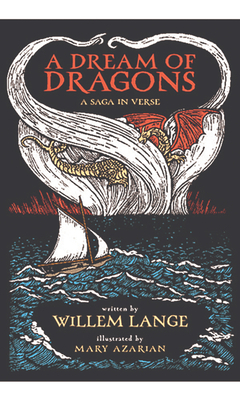 A Dream of Dragons is a proper and modern Norse saga, written with all the power of Melville and Hemingway and a true story now retold in the ageless rhythms of blank verse, as irresistible as the beautiful and specially commissioned woodcuts of Mary Azarian. Mary Azarian has illustrated over 40 books, including Snowflake Bentley which won the Caldecott Award. Mary Azarian moved to a small hill farm in northern Vermont in 1963. vegetable and flower garden. These years on the farm became the basis for the subjects she has chosen to depict in her woodcut prints. In 1969, she started Farmhouse Press and began producing woodcut prints, first printing by hand and eventually printing on a 19th century Vanderhook proof press.